In the previous post, I taught you how to install WordPress plugins. Today, I’m going to tell you which are the WordPress plugins I use for every site I build. These plugins fit for sites in every niche and most of them fill features that WordPress lacks by default. There are also other alternatives for most of the plugins in this list, so you don’t have to use exactly what I use. Note that the following list is not a ranking. The order the plugins are listed is irrelevant, and every plugin on the list below has a different purpose. The Yoast SEO plugin is currently the most popular SEO plugin for WordPress. According to the information displayed on plugin’s official page on WordPress.org, Yoast SEO plugin has so far 5+ million active installations. WordPress is pretty search engine friendly out of the box, but the Yoast SEO plugin really turns WordPress into a search engines’ friend. Allows you to set the meta fields for every post, page, custom post type, category, tag, etc. This is only a tiny glimpse of what the plugin can do. Read more about the Yoast Plugin features on the official page. Lately, have appeared many WordPress plugins designed to supplement WordPress’ SEO capabilities. The biggest competitor of Yoast SEO is All in One SEO Pack plugin. I’ve first used All in One SEO pack, and then I’ve switched to Yoast SEO. Both these plugins are great and have similar features. However, as a personal preference, I like Yoast SEO more. Since most of my websites rely on traffic from the search engines, this is an essential plugin for me, and I use it for each of my sites built on WordPress. Read my Yoast SEO configuration guide to learn how to setup this plugin in the best way possible. While the Yoast SEO plugin helps me with my website’s SEO, the W3 Total Cache is my favorite plugin for improving the performance of my site. There are many other caching plugins, and I’ve used many of them. Even though the W3 Total Cache plugin is probably the most difficult to configure caching plugin due to the high number of plugin’s configurable settings, I think W3 Total Cache is the best and can even make a very slow site fly. According to the plugin’s official page on WordPress.org, currently, this plugin has over one million of active installs. Supports multiple caching levels: page caching, object caching, browser caching, database caching, etc. This plugin has a lot of other features and configurable options. You can view a complete list of features on the official plugin’s page on WordPress.org. A caching plugin will not only help you to reduce the costs of your web hosting by lowering the consumed resources but will also help your website to show better in the results of the search engines. A fast website will also reduce your site’s bounce rate and will make your visitors happier. Akismet is one of the most popular WordPress plugins and is developed by Automattic, the same company behind WordPress. This plugin comes pre-installed with every WordPress installation, but it is not active by default since it requires an API key. The role of Akismet is to prevent the spam comments to be published to your site. It also works along with some contact form plugins. When someone submits a comment to one of your posts, Akismet passes this comment through a series of filters to determine if that’s a comment submitted by a real person or a spam comment automatically submitted by a bot, or even a spam comment sent by a person (Let’s not discriminate bots. People will also add spam comments). 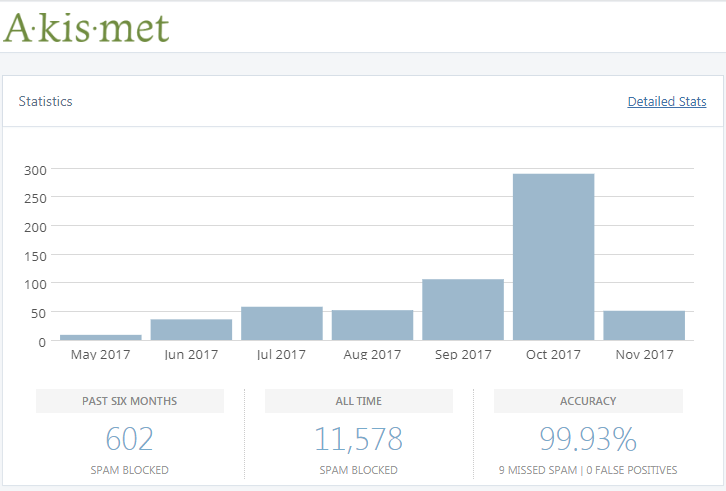 If you have a popular blog, Akismet will block hundreds or even thousands of spam comments every day. So, yes, I would say that Akismet is a very handy WordPress plugin. Below are some stats from my previous blog. And it was far from being a popular blog. So, as you can see in the screenshot above, Akismet has saved my blog from 11,578 spam comments. There are cases when it’s hard to make a difference between a spam and a genuine comment. Some of the spam comments look very close to the real comments, while some of them look utterly awful. Anyway, any spam comments are bad and you don’t want to allow these on your blog because might hurt your site’s SEO score and you will surely lose your readers’ trust. That’s why you should always use Akismet. Just as Akismet, Jetpack is also a plugin from Automattic, the creators of WordPress. This plugin does a multitude of things, and while I don’t use all the features of JetPack, I always use this plugin for my WordPress websites. You will need a WordPress.com account to use this plugin and you’ll be asked to make the connection between your site and your WordPress.com account. This plugin includes some features for improving your site’s security, a few features to help you increase your traffic, and a few options for increasing your readers’ engagement. Jetpack plugin includes various features based on the plan you choose. The free plan gives you access to some cool features, but the premium plans also add a few compelling services, and the prices are very affordable. I haven’t upgraded to a premium plan yet, but I have to admit that I was tempted to do that a few times. For a complete list of the features of Jetpack, visit the official plugin’s page on WordPress.org. The features that I usually use from the free plan are the site stats, sometimes the post sharing buttons, Publicize (the feature for automatically sharing the published posts to the social networks), post and comments subscriptions, and sometimes the login brute protection. Optimus is a WordPress plugin from KeyCDN, the company I use for my site’s content delivery network (CDN). The purpose of Optimus is to reduce the size of the images uploaded to your site using the WordPress media library, without lowering the quality of the pictures. Depending on the uploaded image and its format, this plugin can reduce its size by up to 70%. Optimus also gives you an option to optimize the images already uploaded to your site. By optimizing your images you’ll not only save storage space, but you’ll also reduce the bandwidth consumed by your website, and make your site faster. Optimus will also help you to get rid of the image optimization warnings received when you analyze your website with Google PageSpeed Insights. A little inconvenience of the free version of Optimus is that you can only optimize images that have less than 100kb. To optimize the images with a size higher than that, you will have to upgrade to a premium plan. The good news is that a paid plan is not very expensive and you have to pay yearly. It’s not mandatory to be a customer of KeyCDN‘s content delivery network to use Optimus. Currently, KeyCDN loads your account with $10 (the equivalent of 250GB in free traffic) valid for 30 days when you first become their customer. Reduce Bounce Rate is a simple yet very powerful plugin, that not many people know about. As its name suggests, this plugin is designed to give your site’s real visitor bounce rate in Google Analytics. The bounce rate is a metric used by Google Analytics and search engines to track the time spent by a visitor on your website since he has landed on your site. Is this plugin safe to use? Absolutely. The plugin does not try to fake your site’s bounce rate but helps Google Analytics to track the real user bounce rate. Sometimes, when a user reads a post without taking any action (for example doesn’t click anywhere, doesn’t scroll the page, etc. ), Google Analytics will be unable to track his activity and will think that the visitor has already left your page. Reduce Bounce Rate plugin just sends the real signals to Google Analytics and notifies this service that a visitor is still on your site. Here’s how my blog’s bounce rate (my previous blog) looked like according to my Google Analytics account before installing the Reduce Bounce Rate plugin and how the bounce rate has significantly dropped after installing the plugin. As you can see, before installing the plugin, my blog alternated between a bounce rate tracked by my Google Analytics between 70% and 90%. After I have installed the Reduce Bounce Rate plugin, my site’s bounce rate has drastically dropped to a value between 7% and 21%. Simple URLs is a free WordPress plugin from StudioPress, the same company that has created the Genesis Framework (the parent theme that I use for my blog). Simple URLs allows you create, manage, and track your site’s outbound links (external links). There are more free plugins in the official WordPress plugin directory for this purpose. Another plugin that I’ve used before and which I liked is Pretty Links. Still, I prefer Simple URLs because of its simplicity. I use Simple URLs plugin to make my affiliate links shorter and to keep track of them easier. This way, if I ever want to change my affiliate link for a product or service, I just go to the Simple URLs management menu and change a single URL. Otherwise, I’d have to review every post published on my site where I have placed that affiliate link and then edit the links manually one by one. Another advantage of using a link management system is (doubtful) the SEO benefit. Many people claim that search engines do not like sites that contain too many affiliate link. In a way, this is understandable because sites that promote affiliate products are often of inferior quality. I say “doubtful” because the search engines have become very smart and their crawlers can now follow the links and might even make a difference between an affiliate link and a non-affiliate link. I think the safest approach would be still to add the “nofollow” attribute to your affiliate links and to block the indexing of them using the robots.txt file. As its name suggests, all this plugin does is to create a contact form. I prefer this plugin over plugins more complex, such as Contact Form 7 because I usually only need a simple contact form for my contact page to allow my readers to send me emails. This plugin has a single role and does its job very well. The contact form is displayed by placing a shortcode in page content editor, so you can name the page whatever you like, and it’s not mandatory to have your contact form at example.com/contact. You can see an example of the contact form generated with this plugin, on my site’s contact page. Clean and Simple Contact Form is responsive and integrates very well with the design of your site. I like the fact that the form data is submitted via Ajax and the page doesn’t reload when a user submits it. Another very cool feature is that you can easily add the Google reCaptcha to your contact form in order to prevent the spam bots sending you emails all day long. Choose your plugins wisely and always based on the niche of your site and your needs. I usually use more plugins (free or paid) for my sites depending on my needs for that particular website. The plugins mentioned in this article do not add niche-specific features to my website, but general features that I always need. I use the plugins listed above regularly for my sites built on WordPress. Hopefully, this post will help more fellow bloggers to discover these super useful plugins.